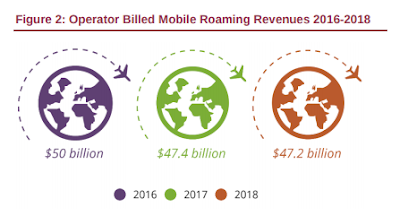 Mobile roaming has traditionally provided network operators with an opportunity to gain additional service revenues. However, regulatory policy interventions, such as the EU law to abolish roaming in member states, is having a negative impact on roaming revenues for many network operators across the globe. According to the latest market study by Juniper Research, mobile network operator revenues from international mobile roaming are expected to recover slightly, following a decline in 2017 after the introduction of RLAH (Roam Like at Home) in Europe and other markets. However, overall mobile roaming revenues are expected to stay flat over the next 4 years, representing around 6 percent of total operator billed revenues and $51 billion in value. RLAH enables mobile communication network subscribers to use their monthly voice, data and messaging allowance while roaming -- without incurring additional service charges. Juniper found that driven by the introduction of RLAH packages in EU and other regions such as North America and Asia-Pacific, the mobile roaming market witnessed a significant rise in data usage and internet traffic. In 2017, Juniper estimates that mobile data traffic grew by 200 percent globally, and by 260 percent within Western Europe. “While the overall proportion of 'silent roamers' continues to fall in many markets, driven by RLAH and cheaper bundles, the market also witnessed operators extending RLAH to more countries over the past 12-18 months. Additionally, a number of neighboring countries are announcing roam-free intra-regional agreements, similar to the EU,” said Nitin Bhas, head of research at Juniper Research. Juniper estimated that the proportion of silent roamers not using any data roaming services in 2018 accounted for 51 percent of total data roamers globally -- that's down from 72 percent in 2013. Following Britain’s decision to leave the EU, it has been reported that, in the event of a no-deal Brexit, mobile operators will be able to implement roaming charges. Under such a scenario, Juniper expects that the average roaming cost per active UK roamer could nearly double by the end of 2022 due to higher costs. However, Juniper considers such a situation to be unlikely and instead mobile network operators will continue to focus on other revenue streams, such as providing managed services in the Internet of Things (IoT) sector.